Part four of a six part examination of various recent documentaries, which I expect to finish by the end of the month. ♫They call him Flipper! Flipper! There’s a lot of truth to the last lyric. Dolphins are absurdly intelligent mammals. They know fear, they use tools, they communicate with each other. Ric O’Barry knows this. He was one of the trainers for the TV show Flipper in the 1960s. During that time, he saw the conditions and results of keeping dolphins in captivity, often in terrible conditions. He contends that they become increasingly aware and depressed, and that he’s seen one of them commit suicide. Over the years, he became a guerilla activist, freeing dolphins from egregious scenarios through some sometimes illegal methods. He’s been banned from the International Whaling Committee (IWC), but his actions have spoken loudly, and brought attention to the dangers of captivity. 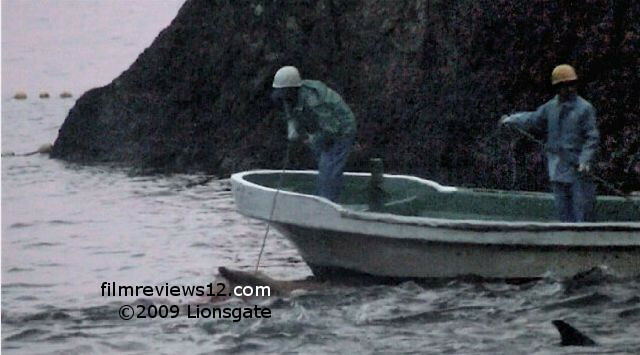 O’Barry’s probably one of the worst enemies of the fishermen in the town of Taiji, Japan. Every September, unbeknownst to the Japanese public, said fisherman slaughter tens of thousands of dolphins. The water runs deep red, and the meat is disguised and sold. It’s an extremely well guarded secret – imagine the public outrage if all of this information had gotten out at once. This reaction is exactly what Louie Psihoyo’s disturbing and effective exposé The Cove is gunning for. It doesn’t feel like a documentary – it feels like a heist film. Most of the setup shows how wary Taiji town officials are to the approach of a camera crew. Horrifying footage is obtained through hidden cameras designed as rocks. Much of the literal investigating is done at night and covertly. The Cove digs in deep to the total implications of what’s going on – when the filmmakers take to the streets of Tokyo, we see the shocked reactions of passers-by as they are told what is going on. Their responses are genuine, they clearly didn’t know. There’s no justification for animal cruelty, but that doesn’t mean people don’t argue in its favor. 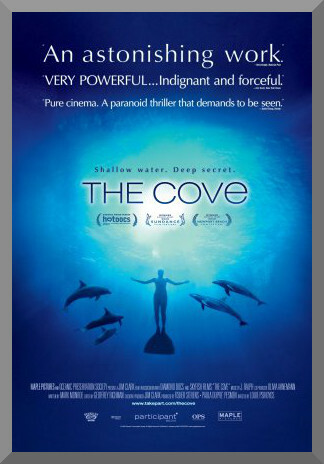 The Cove, 91 minutes, is emphatically one sided on this issue. I’m not sure if I wanted to hear anyone’s point in favor of this practice, but it might have solidified The Cove’s feeling as a full, complete film. Considering the reputation of outsiders, it’s not particularly surprising that no formal counterargument was formed; early on, O’Barry remarks that the fishermen would kill him if they had the chance. The lack of a round existence is the film’s biggest stumbling block, and for the most part, it may have been beyond its control. Regardless of its balance, The Cove is still startlingly brilliant in its existence. You’re informed and enraged. Through impassioned defenses, incriminating footage, and ingenious formatting, we have a documentary that works, despite its shortcomings in both length and presentation – it’s still watching a completely nonfictional story unfolding with the persuasion of any multi-million dollar thriller.